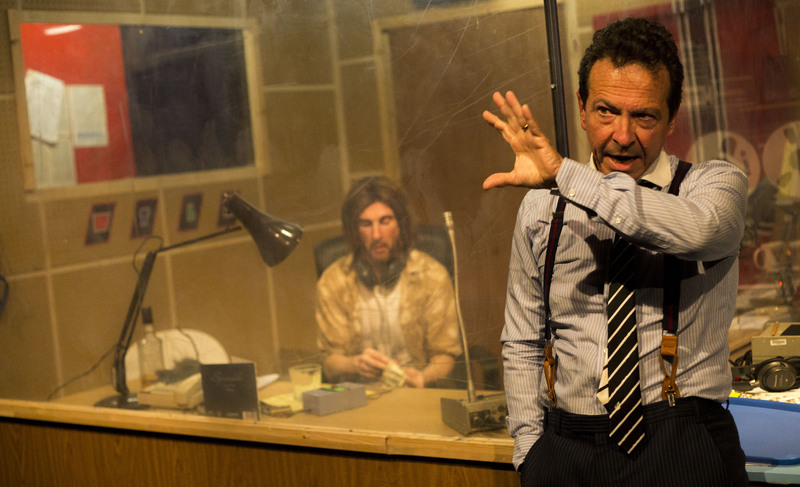 Late Night, tell-it-how-it-is radio — a premise with the potential for shocking, humorous and meaningful dialogue, but Eric Bogosian’s play lacks depth and originality, with this production feeling in turns forced and unnatural. Barry has risen to fame due to the success of his listener phone-in show, and we join him along with his production team on the last night before the programme is nationally syndicated. The plot runs across his two-hour offensive and opinionated show, and as we watch, we also get a glimpse into his own dysfunctional life and complex relationships with the rest of the cast. Bogosian’s play lacks content, but Sean Turner’s production also somewhat fails in its attempt to revamp or add gusto to a work that premiered 30 years ago. The play noticeably lacks excitement and much of it feels repetitive, making it difficult to engage in the story. We get over a third of the way in before any real plot line develops, and even when it does, there is a lack of background or context. The relationships between characters seem unnatural, which is possibly the prompt for three slightly odd monologues from the supporting cast, talking about their experience of Barry. Putting my reservations with the play itself aside, this production is fine, but as already mentioned struggles to ignite the dialogue into a gripping piece of theatre. Fortunately, Matthew Jure is great in his portrayal of Barry. He throws all his energy into this non-stop role, perfectly in control of the action and bursting with emotion. When talking to callers, he is scarily believable, and there are noticeable similarities in his performance to those of some of today’s more controversial right-wing commentators. Being ‘live on-air’, he relies on his body language and facial expressions to portray the character’s actual feelings towards the callers and this provides a number of laughs throughout the play. His interactions with the other characters, in particular Linda — his producer and occasional lover — work far less well than when he is receiving calls. Indeed, these interactions appear to be filler to break up the main premise, and Molly McNerney, as Linda, is left with very little to do with her role. It is difficult to believe the two characters are in a relationship and again, it feels like an undeveloped storyline. George Turvey does a decent job as producer Stu: a laid back, free flowing ex-disc jockey, and friend of Barry’s. His calm persona nicely counterbalances the erratic Barry, and while the actor doesn’t have too much dialogue, he is very watchable in his supporting role. The cast is completed by Andy Secombe, who plays the radio station manager in a fairly hammed-up but admittedly fun-to-watch way, and Ceallach Spellman, who sparks some life into the play when he enters late on, as the young, stoner super-fan of Barry. Max Dorey’s design should be commended, with his attention to detail really adding to the setting. The small performance space is taken over by a masterfully created grimy 80s radio studio littered with gadgets, trinkets, and litter that really aid in placing the piece. Turner navigates his cast around this intrusive set well, and cleverly uses the noise-cancelling studio screens for comic effect. There is a lot about this play that I want to like, but sadly it just doesn’t do it for me. The production feels about 30 minutes too long, and while the entire cast have their moments, I spent a lot of time engrossed by the detailed set rather than the action itself.